The number of cases of food contaminated with Listeria is growing and with it the dangers to pregnant women—are you on top of the latest recall? Brace yourself: Papa John's Salads and Produce has joined the growing list of food companies running product recalls due to possible Listeria contamination. 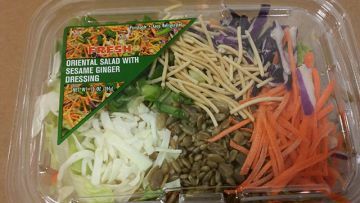 The brand is voluntarily recalling its ready-to-eat Oriental Salad with Sesame Ginger Dressing because the product contains sunflower seeds that are part of the recent SunOpta sunflower kernel recall expansion of that same scare from two weeks ago. A quick refresher: Listeriosis (the infection caused by listeria) is no joke—especially during pregnancy. It's characterized by high fever, severe headache, stiffness, nausea, abdominal pain, and diarrhea. And it can cause serious and sometimes fatal infections in young children, frail or elderly people, not to mention miscarriages and stillbirths in women who are expecting. Luckily, there haven't been any reports of illness from the salads just yet, and the company is currently working with their customers to remove the products from store shelves and distribution. In the meantime, you should probably give your fridge a good once (or twice) over just to be safe. Here's what to look for: 10- and 13-ounce pre-packaged containers of Papa John's Salad with Sesame Ginger Dressing with sell-by dates—located on the left side for the 10 oz. package and top side for the 13 oz. package—from May 18 through May 25. The affected products were distributed in the following eight states: AZ, CA, ID, MT, ND, NM, OR, WY, and specific retail stores affected include Albertson's, Safeway, Bashas', and Food 4 Less. If you find one in your home, throw it away immediately or return it to the store where you bought it. More information on the recall can be found on the FDA website. And if you have any questions at all, call Papa John's consumer relations at (480) 894-6885 ext. 125. Fingers crossed that this will be it for a while!